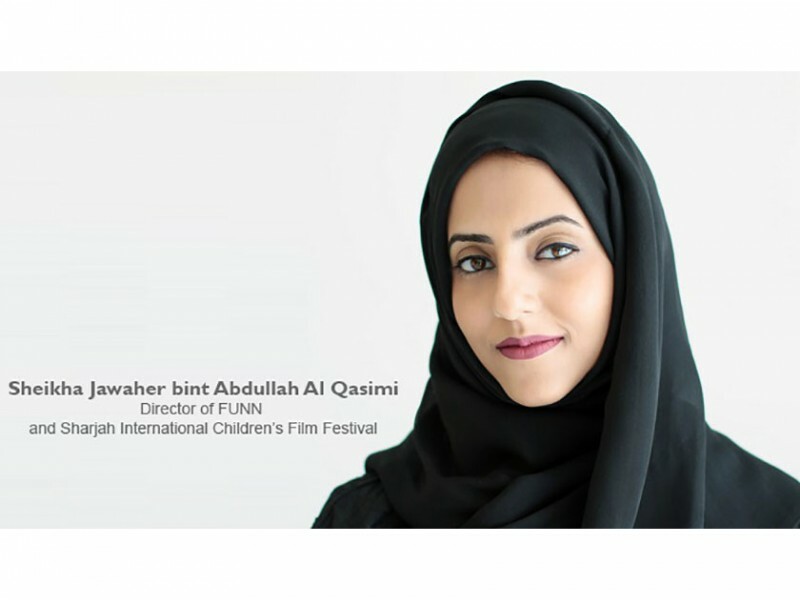 SHARJAH, 11th August, 2018 (WAM) -- Cinema is a universal language that brings people together and breaks all discriminatory barriers by offering a common platform to all, stated Sheikha Jawaher bint Abdullah Al Qasimi, Director of FUNN and Sharjah International Children’s Film Festival. ''Film is a multi-doctrine creative art that really speaks one language to every enthusiast and lover, and embraces individual interpretation no matter how many there are. This shows the immense influence of cinema on children and their imagination. This is why the young cling to their imaginary heroes. Cinema has become the most effective mass media instrument in today’s world. This clearly demonstrates the major role it plays,'' she said in an opinion piece to mark the International Youth Day on 12th August. She says:''While Leonardo da Vinci was sitting in a dark room, he noticed a beam of light passing through a small hole, about the size of a pinhead. When in a dark room one can see reflections of images like trees, humans, vehicles and others are projected on the wall, facing the light passage. This small light beam that fills small dark holes has illuminated the world. This small beam of light can light the way, but not for too long. Not without a vision and its continuity. From a deeper perspective, this beam of light did not just reflect shadows of humans and vehicles; it reflected their lives, their ideas, and other details that made them, themselves. This story can be related to the one that led to the invention of the camera, a turning point in history that paved way for the development of cinematography. Cinematography has a profound effect on us – it has played a powerful role in projecting imagery to reflect cultures and ideas, thus playing a key role in shaping our opinions and the way we see the world. As we observe the International Youth Day, we emphasise two key messages that govern and regulate our work at FUNN, and the way we organise the Sharjah International Children’s Film Festival (SICFF). The first message is that FUNN is keen to introduce our children to the modern cinema industry and provide them with valuable films, which will introduce them to human messages and artistic contexts. The second message is to cultivate a film culture among younger generations by igniting a love of film in them, and offer them the tools they will need to build on the Arab cinema experience. If a society lacks film culture, there will be no cinema. In fact, no one can deny the vital impact of cinema in our lives. Since the cinema industry was born, film has had a uniquely powerful and ubiquitous presence in human culture. It plays a major role in building values and creating a new and modern language that helps us better understand our own lives, especially for younger generations who receive with art with much wonder and amazement. Due to the influence of cinema on young people, filmmakers must give extra care to the issues and topics raised in movies targeting children and teenagers. Film industry professionals should pay attention to the need to build and strengthen community values and concepts that enrich intellects and knowledge of young people. Cinema is a universal language that brings people together. It breaks all discriminatory barriers by offering a common platform to all. Film is a multi-doctrine creative art that really speaks one language to every enthusiast and lover, and embraces individual interpretation no matter how many there are. This shows the immense influence of cinema on children and their imagination. This is why the young cling to their imaginary heroes. Cinema has become the most effective mass media instrument in today’s world. This clearly demonstrates the major role it plays. The Arab film industry is still suffering from a crisis. It is a crisis of both technique and content. Obstacles that stand in the way of having a good cinema industry can be attributed to the declining film culture in Arab societies. This has contributed to reducing its presence and influence compared to what it looked like in the past. Arab cinema has become somewhat elitist, and hence there is still a long way for it to compete with global cinema. No society can make good films till they have a film culture. Based on this fact, we at FUNN, are keen to support creative professionals in the cinema industry, whether writers, filmmakers or illustrators and help them establish a new cinematic culture, which will bring Arab cinema back to the golden era of its prosperity. Through a set of plans and programmes, we aim to build an advanced culture of creativity in filmmaking. This stems from our belief that young Arab generations who have become more interested in areas of advanced technology and media arts are able to make their way toward shaping a better future for Arab cinema, adding human and global dimensions to it. This is what we hope to achieve through the continuation of the Sharjah International Children’s Film Festival (SICFF) – to serve as a platform for young people to unleash their imagination and creativity, and ultimately achieve the creative goals of Arab cinema. We believe our children and youth have great potential to learn. So, we attract an elite group of leading industry professionals to SICFF to share their expertise and abilities with them and engage them with the silver screen to learn more about the movie industry and its techniques. SICFF witnesses a series of workshops, which are designed to foster and inspire young cinema enthusiasts and help them reach their full potential at the forefront of the global creative arena. This year, the world’s celebration of youth focuses on the importance of creating safe spaces for young people to come together, engage in activities and exchange ideas and sights that simulate their imagination to dream of a better future.